This is a classic Fine Arts Festival. 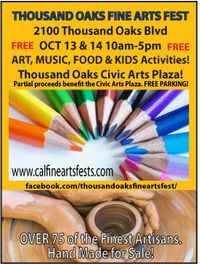 Celebrating the Arts in Thousand Oaks. Artists will have their beautiful hand made art for sale. A percentage of all sales helps support the Civic Arts Center. Beautiful one of a kind pieces make great Holiday Gifts. Jewelry, Paintings, unique items that only the West's finest Artisans can produce! Very affordable. LIVE MUSIC all day with incredible local talent. Great food to! There will be Art activities for the kids and it's all FREE! Including the Parking FREE!